As the days get longer and winter draws to a close, the time to prepare the fields for the coming spring season approaches – not just in the countryside, but also in the city. While it is still too early to plant outside, preparations of the garden beds are already underway. In Amsterdam, I am involved with several urban agricultural initiatives, which I first came to know about via the “Farming the City” website. I will blog more about these in the coming months, but wanted to share some photos & stories already now as the work has begun. 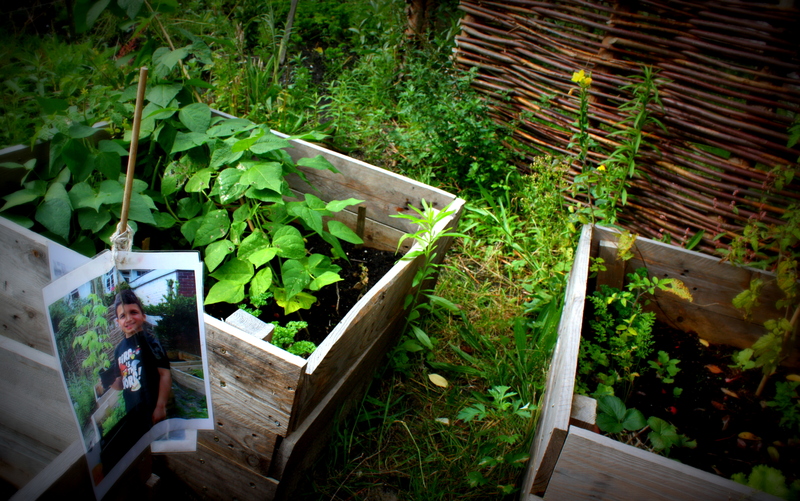 I attended the “Amsterdam Harvest Event” in August 2012 featuring urban agricultural (UA) initiatives in Amsterdam; after which I (sporadically) volunteered with a UA project in the Amsterdam West district. Located in a central courtyard of a social housing block, it is appropriately called “I can change the world with my own two hands” (ICCTWWMTH: how’s that for an acronym?) Being the name of one of my favorite Ben Harper songs (which happens to be my alarm every morning to help me wake up empowered & ready to take on the day) I was keen to join. 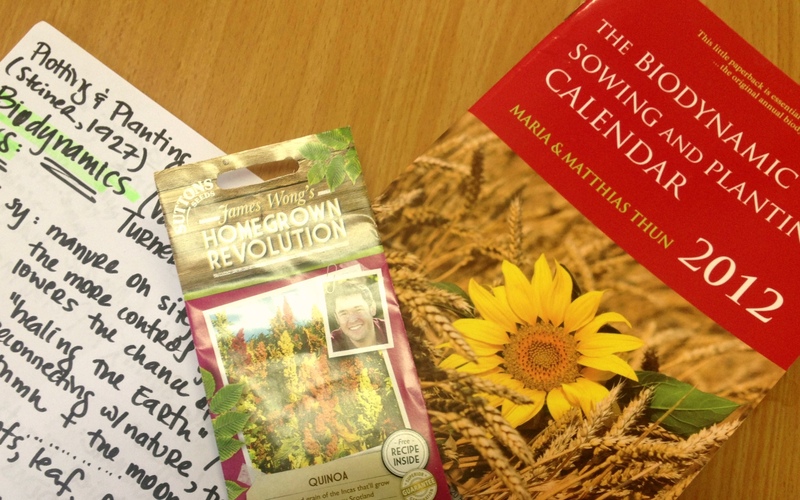 Of course this was rather late in the season to volunteer – just in time for harvesting, weeding and collecting seeds. Still, I hope to become more involved in next year’s garden. Even with just a few visits, it was an impressive sight. In the courtyard were 17 individual gardens run by local residents, a children’s vegetable garden, a herb and edible flower garden, as well as a large common garden in the centre. This common garden grew food; the harvest enjoyed by neighbors or sold at open days and in a mobile shop. I was amazed how much could be produced on a relatively small urban plot – carrots, kale, herbs, salads, tomatoes, pumpkins, peas, strawberries, onions, corn, potatoes and more. 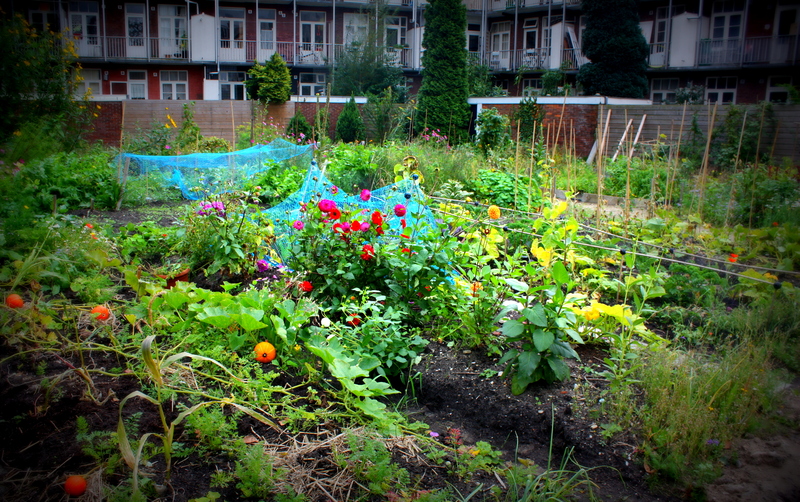 Launched in 2011, this garden aims to empower urban citizens to grow healthy & eat healthy, right in the city. ICCTWWMTH connects health & environmental issues related to local food, while generating social capital amongst citizens who come together to get their hands dirty. 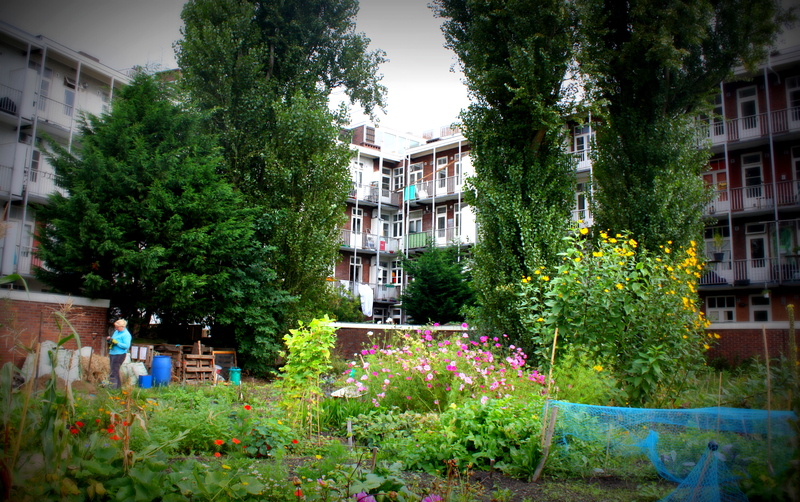 In Amsterdam, there are many ways to get involved in urban agriculture & much to learn for beginners. At the same Harvest Event, I learned about Cityplot. Cityplot offers workshops on how to grow your own food in an urban way: using window gardens, composting with worms on your balcony or in your kitchen, seed saving, etc. 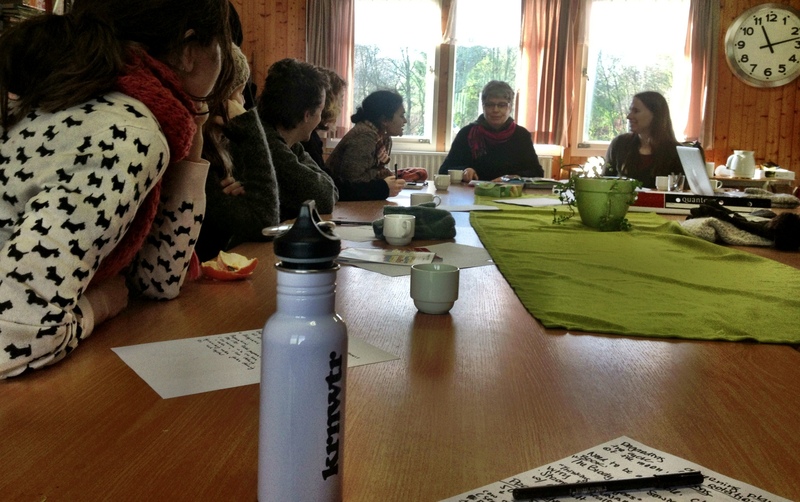 (I took their workshop on worm composting & hope to take a few more workshops this spring.) A full list of their upcoming workshops can be found here – highly recommended if you are in Amsterdam & have the chance! 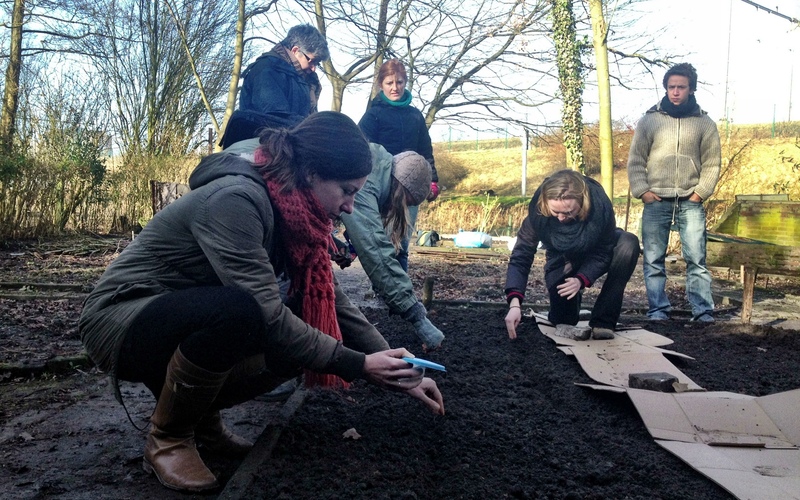 Since urban agriculture requires hands-on-learning for urban residents (with or without farming & gardening skills), Cityplot & ICCTWWMTH teamed up to launch a new educational garden in Northwest Amsterdam. 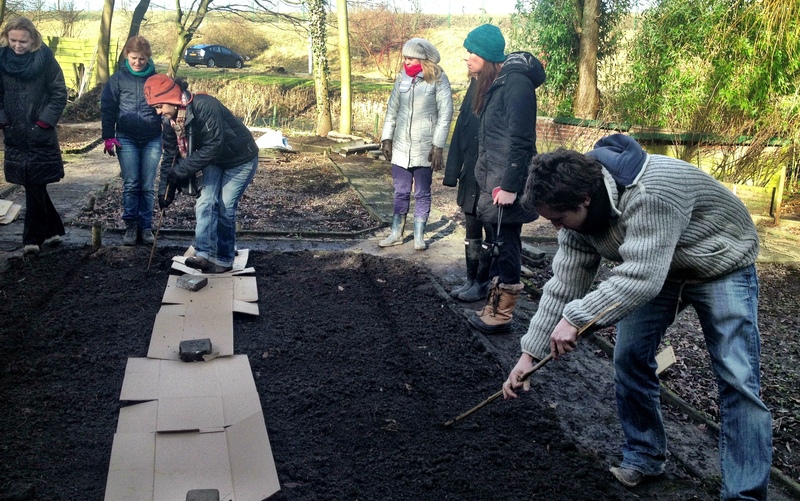 They applied and received support for an urban agriculture allotment (volkstuin), the tools needed, as well workshops with expert gardens to share their tips and tricks. 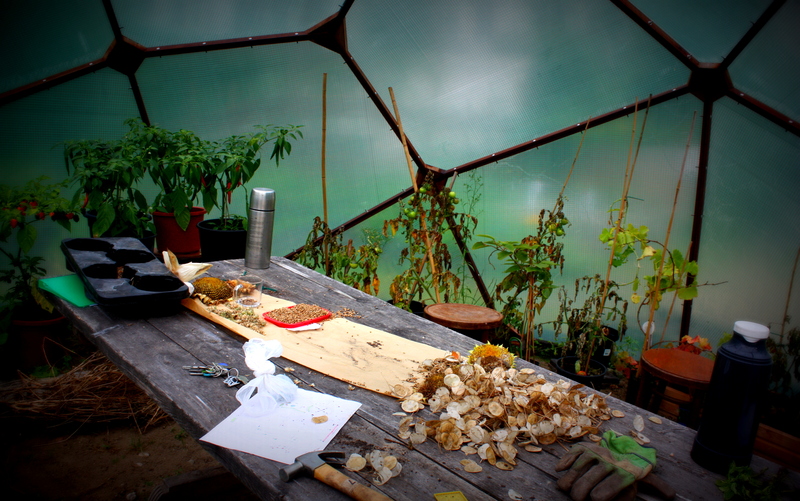 Over the next few months we will be learning about biodynamic agriculture, permaculture, eatable herbs & flowers, heritage vegetables and more. I am sure I will write about this again; but as we had our first workday to aerate the soil and prepare the compost bins (sunshine included), followed by a workshop on (urban) biodynamic farming, I thought to share our progress! A local expert informed us about biodynamic farming: learning to plant by the cycles of the moon & the role of the cow horn. Biodynamic farming practices closed-system-farming focused on healing the Earth & the soil. There are 4 main (rotating) crop groups: roots, leafs, fruit and flower, and when you plant depends on the different Earth signs – each crop group has a different planting and sowing time. (Think how the moon influences the tides, this can also influence farming.) As this is a new plot in an urban setting, we will use the biodynamic method more as a guideline. Heading out to the plot with freshly aerated soil. We planted Phacelia as a cover crop/ green manure to keep the soil healthy before the growing season. With WordPress, there is such a widget that I was able to figure out. (And I am not so technical)… Good luck!